Check out Korea's No.1 Sterilizer brand, uPang's Trade & Upgrade Promo! 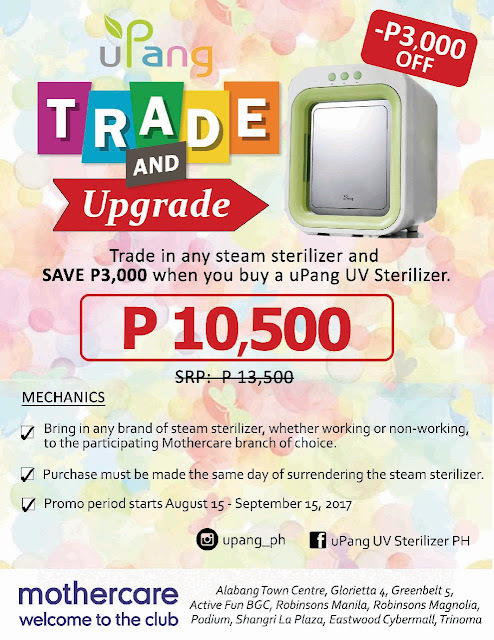 Trade in any brand of steam sterilizer and SAVE P3,000 when you buy an uPang UV Sterilizer! This promo runs until September 15, 2017.
uPang is Korea's #1 UV Sterilizer brand and with it, one can sterilize and dry items in just a touch of a button, no hot water needed. Aside from baby bottles, uPang can also be used to sterilize toys, plates, cutlery, utensils, food containers, mobile gadgets, and even make up items - definitely an investment that can be used not only for your child! 🚩 Eliminates 99.9% of germs and bacteria using its Dual Philips UV lights. 🚩 Super convenient - sterilizes and dries in just a touch of a button! No hot water needed! 🚩 Versatile - can be used to sterilize teether, toys, clothes, cotton, utensils, cutlery, and even mobile phones and makeup!! Korea's #1 top selling UV Sterilizer. Say goodbye to old baby bottle sterilizers and discover how to sterilize and dry the easy and safest way today! For more info, please visit upang.com.ph. Amazing offers on sterilizers. Here are some more details about glass bead sterilizers. Biomedical sterilizer is same as medical application but not medical. Here glass bead sterilizers, Micro organism are killed in 10 seconds by glass bead sterilizers, it prevent samples form organic elements. The process by which micro organism are killed in 10 seconds is sterilization, we can use glass bead sterilizers to prevent samples form organic elements.